While Ski Canada staff slaved away another hot summer in the city preparing the annual Buyer’s Guide, our writers, photographers, ski testers and other latch-ons continued to lead some pretty enviable lives. Having ?led most of his copy in early summer, my buddy Dilbert, for instance, taunted me with various photos of him hanging off a towering grey rock face a few minutes from his home in Canmore. Badger was ?nding solitude in some pristine ?y- ?shing rivers in the U.S. West. Cam went off to ?t boots in Switzerland, while Joe went shoe-shopping in New York City. Oaker landed a new gig as Middle East correspondent for The Star. Wendy went to Chile with a gaggle headed for the gates. Ian with one i (that’s one i, not one eye) was paddling some of the best rivers in Canada. Martin collected huckleberries with grizzlies. Heidi and Babycakes headed back to Australia for their umpteenth continuous winter…and the parade went on. 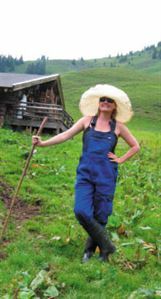 Although I had pictured Leslie wearing some lacy dirndl number with her hair in pigtails, only the men on the mountainside went traditional and pranced about in lederhosen. “Their pants,” wrote Leslie in one vivid e-mail, “have been handed down (possibly at arm’s length) from grandfather to son to grandson.” And no, don’t be silly, of course they’ve never been washed.